The article below covers the entire scope of information related to the Trovigo browser hijack virus based on a thorough research of its origin, technical profile, and impact upon an affected computer system. Special attention here is paid to the methods applicable for removing this adware. It turns out custom browser settings are not nearly as invariable and user-defined as they should be – as long as apps like Trovigo are on board. Manifested as an extension, plugin or some other sort of browser helper object, this adware automatically changes the homepage and preferred search provider values to Trovigo.com, thus annihilating the user’s prerogative for deciding where to go online and when. When operating on a PC, this infection tends to affect all web browsers installed, making them act up in a similar fashion but trying to persevere as a ‘master’ add-on somewhat differently, varying across browsers. For instance, it may impact the ‘Add-on Performance Advisor’ feature in Internet Explorer to its own advantage, and configure Mozilla Firefox to disregard competing applications’ attempts of modifying certain settings or preferences. Trovigo is known to be distributed along with another malicious program called Search Protect by Conduit, one of today’s most prevalent adware apps. Therefore chances are you will have the respective entry displayed amongst the installed software components on your machine. These PUPs (potentially unwanted programs) are mostly brought to a PC with freeware applications whose seemingly de-commercialized essence is compensated through the obscure or insufficiently explicit promotion of malign objects. Some widespread examples include streaming video conversion solutions, download managers, etc. What’s interesting is that uninstalling these third-party apps will in no way help you get rid of Trovigo.com and its Search Protect companion. 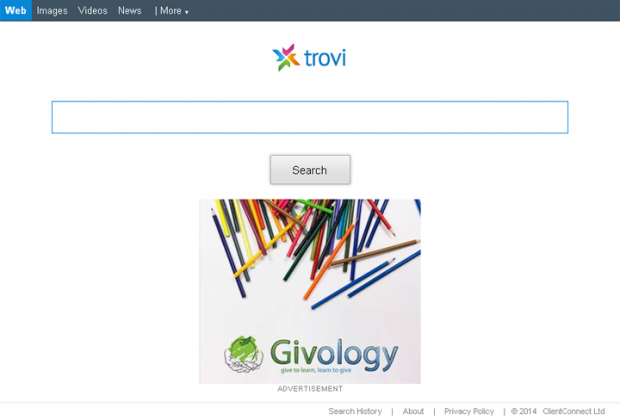 Trovigo.com is a web search system of a kind, but its results pages contain an unwanted abundance of sponsored links above the fold. This fact explains the underlying monetization scheme, which is a pay-per-click or similar traffic generating system. Obviously, that’s not something anyone would be willing to be part of, especially at the expense of normal online surfing experience. To learn how to completely eliminate the Trovigo pest from your browsers, review the removal part of this guide carefully and stick to the listed recommendations step by step. Extermination of the Trovigo hijacker can be efficiently accomplished with reliable security software. Sticking to the automatic cleanup technique ensures that all components of the infection get thoroughly wiped out from your system. Open Control Panel. 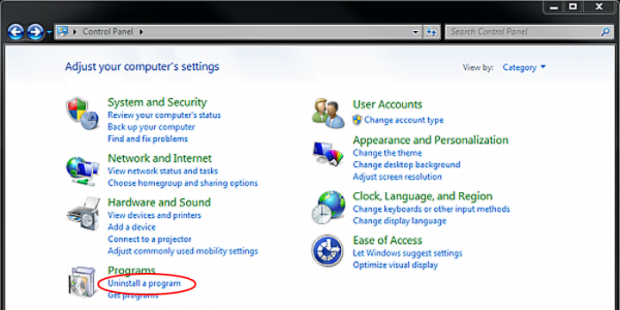 On Windows XP / Windows 8, go to Add or Remove Programs. If your OS is Windows Vista / Windows 7, choose Uninstall a program. Look for Trovigo, Search Protect, or other software potentially affiliated with Trovigo.com on the list (Fast Free Converter or similar freeware that was recently installed) and click Uninstall/Change option to get those removed. Click on Help menu and select Troubleshooting Information from the drop-down list, or type about:support in the URL field. 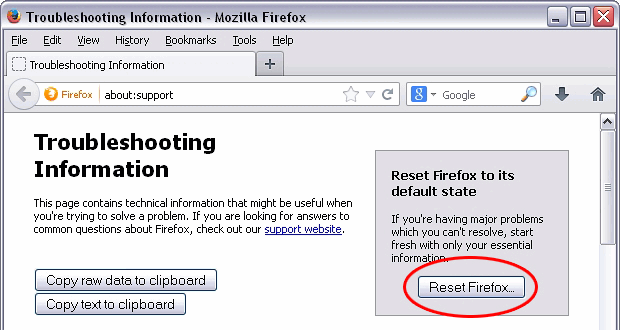 On the Troubleshooting Information screen, click Reset Firefox option. 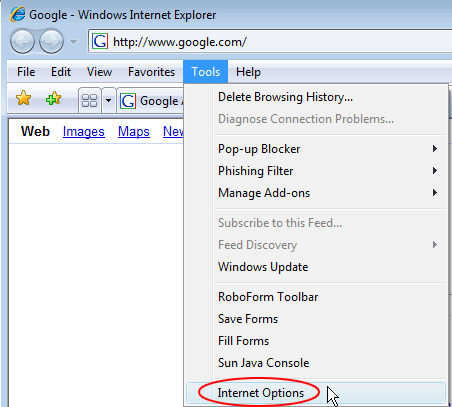 In IE, go to Tools (Gear icon) and select Internet Options from the list. 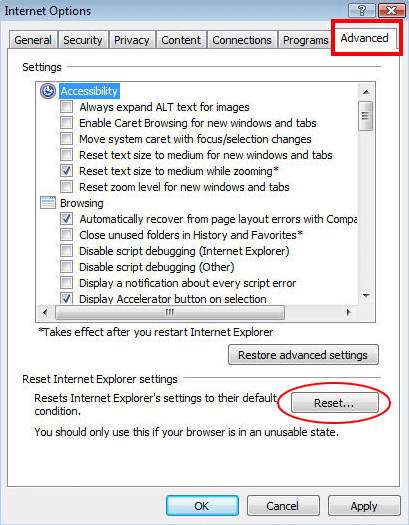 Hit the Advanced tab and click on the Reset option. 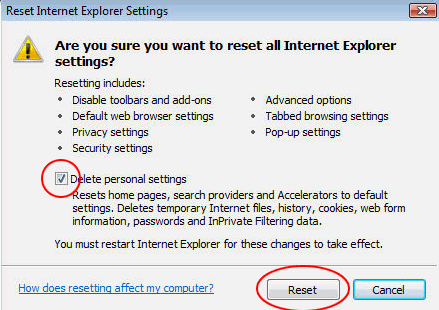 IE will now display Reset Internet Explorer Settings box, where you should put a checkmark next to Delete personal settings option and click Reset at the bottom. 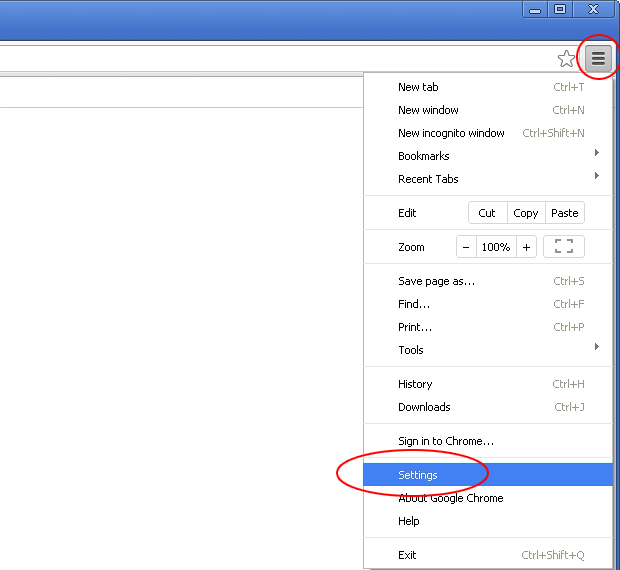 Click on the Chrome menu icon and select Settings. 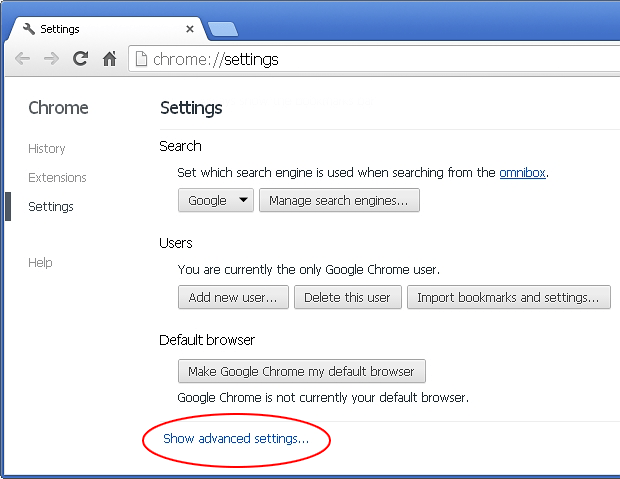 Locate Show advanced settings option and click on it. 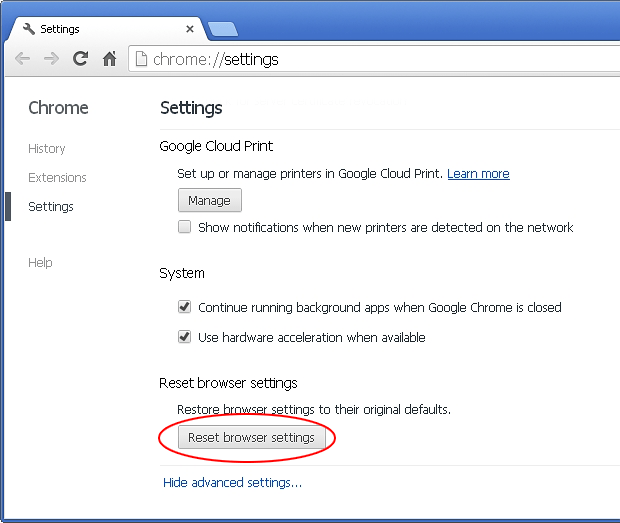 Now you need to click on the Reset browser settings button at the bottom. 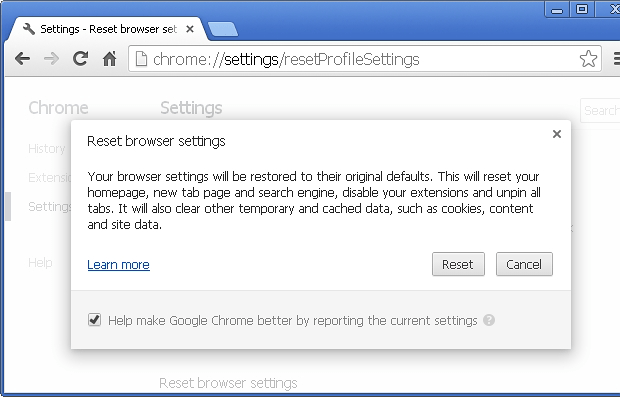 Chrome will display a confirmation dialog box listing the types of data that will be lost if you proceed. Read the message carefully and, if you’re sure, click Reset.